Ergonomically designed to easily fit in your pocket, bag or purse. This small but powerful Dual USB Chargers powers most conventionally everyday electronics such as Smart Phones, Tablet Computers and portable gaming devices. Built in Fuse and Power indication light provides protection for both user and your car. Rotational Cigarette plug allows you to mount and dismount the unit with ease. Renu in a snap! Renu is the smart line of decorative electrical products from Leviton. Install Renu and get a fresh stylish look, plus the ability to change the color of any Renu device when you update a room. The line includes switches, outlets, GFCIs, dimmers, and sleek, screwless wallplates available in 20 designer colors. The Renu face plate RKAA1 makes it a snap to change the color of Renu 15A USB Charger/Tamper-Resistant Receptacle/Outlet, without rewiring or needing an electrician. Just order a face plate in the color of your choice and follow the simple directions to replace the existing face with a new hue. Snap on a wallplate (sold separately), and youre done. Leviton's TR receptacles are permanent and reliable. They are designed to help protect children from the hazards of inserting foreign objects into electrical receptacles , A shutter mechanism inside the device blocks access to the contacts unless a two-prong plug is inserted, helping ensure foreign objects will be locked out. Tamper-resistant receptacles are required by Canadian Electrical Code in new and renovated residential construction. 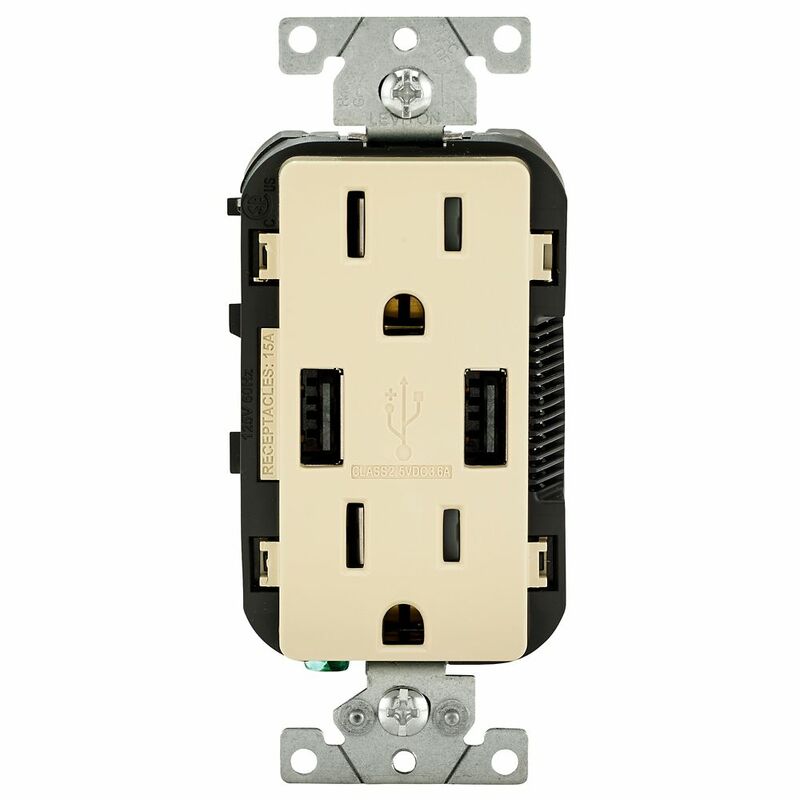 Combination Duplex Receptacle/Outlet and USB Charger The Leviton USB Charger/Tamper-Resistant Duplex Receptacle offers two high-powered USB Ports with 3.6A of charging power and two 15A or 20A/125V Tamper-Resistant Receptacles. It has the capability to charge two USB powered electronic devices utilizing its two USB Ports, leaving the two Tamper-Resistant Receptacles free for other uses. The Leviton USB Charger/Tamper-Resistant Duplex Receptacle is designed to charge tablets, smart and mobile phones, gaming devices, e-readers, digital cameras and a host of other electronic devices. Combination Duplex Receptacle/Outlet and USB Charger is rated 4.0 out of 5 by 1. Rated 4 out of 5 by Darby from USB charging ports are very handy. The unit installed like a normal Duplex receptacle. However, it consumed a large area of the device box and installation had to be made in device boxes containing a minimum number of conductors (Similar amount of room to a GFI Outlet required). The "Ivory" coloured units do not seem to be available at any retail outlets and had to be ordered through the "on-line" option. I am 100% pleased with the unit and the shipping through Home Depot"